Dante’s Destiny is a thrill ride that will keep you guessing, until the end. Just when you think you have it all figured out, you realize that you don’t have a clue. 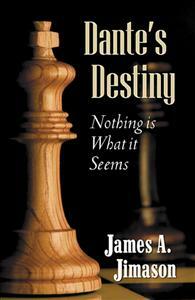 Dante’s Destiny is a thrill ride that will keep you guessing until the very end. The battle between good and evil goes beyond the natural and into the supernatural, where nothing is what it seems. Dante struggles with the constant turmoil that plagues his family, while searching for the meaning of his life. It’s when you think you have it all figured out that you realize—you don’t have a clue. So hold onto your seat and get ready for the ride of your life. Also, pay attention to the words in italics, to discover a hidden message. Reviewed by In the supernatural novel Dante's Destiny readers will be taken on a spiritual journey, with a carefully woven storyline that centers on the Simms family. More so Dante Simms and what his true destiny is and how in the battle of good versus evil it is quite appealing as well as enlightening to see who will prevail. It is also a delight for the author’s ability to send such an important message through subtle hints that make this novel interesting. Dante's Destiny is a definite pleasure ride that will have readers on the edge of their seat as they will not be able to predict what the author has in store for them. Readers will eagerly turn the page because though it is somewhat of a supernatural book, you will not be able to deny the fantastic storyline that is ever so present. The Simms family just tries to make sense of their everyday life as they are constantly the victims of some sort of tragedy at any given time. Author James A. Jimason does an astounding job of telling a story that will make the readers think about life choices since this story really shows that there is truly a reason for everything that happens- a true battle of good versus evil at any given time. As for Dante’s Destiny character Dante was truly ordained to be all that he could and though there were often attempts to sway him off his beaten path he still raised from those negatives to finally see the light at the end of the tunnel. Dante's Destiny was truly a insightful read as readers will not be disappointed, if anything the disappointment will appear as the readers completes the novel and you are left wanting more as you see this storyline playing out in your mind as you turn each page. If you are looking for an exhilarating, fast read with an incredible message then Dante's Destiny is definitely the book for you. This was a literary job well done for James A. Jimason and I look forward to his next efforts.